Happy Sundae Peeps. The new Challenge over at Paper Sundaes is Paper Piecing. To start with, I was only going to piece the umbrella. Then I did the boots. Then I did them again and decided I still didn't like them. Then I coloured them and did them as they are now. 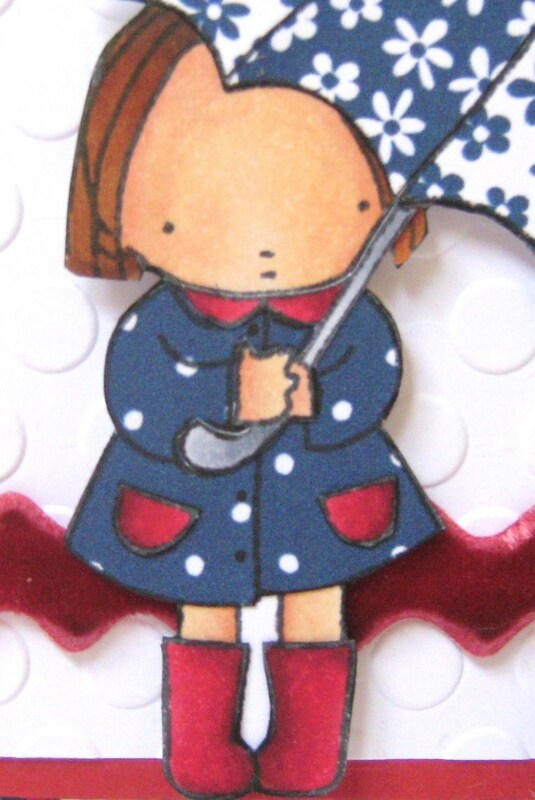 Then I did the coat, which made me realise I needed to do the hands and umbrella handle. Then I thought the collar and pockets didn't look right, so I did them again too. So, there's not really much on this image that didn't get pieced to within an inch of it's life. That's what I call value for money! You'll notice this card contains a number of my current favourite things. I say current, because I'm quite a fickle Fluff, the wind just has to change direction and I have a new favourite! So today, I'm loving; Pure Innocence Images (Heather Ellis is the sponsor this week at Paper Sundaes.) 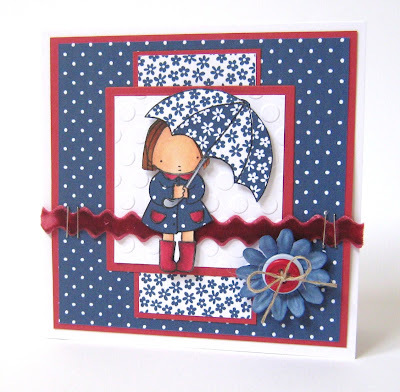 dots, red, white and blue, velvet ric rac, embossing behind an image and twine. If I could have got some stars on there too I would have! Anyway, that's all from me today Folks. Have a lovely Sunday afternoon. Mwah, mwah. Just too gorgeous. Love everything about it. Heather Ellis images are just too cute - may have to get out some of mine and join in with this challenge!! Love the little paper pieces you have used ! Quite some work ! Precious! Love the paper piecing and that wonderful rick rack! So cute. Hi Faye, Fab card! Love this sweet image and gorgeous colour combo. I have just sat down with a coffee and an orange club bar so the title of your post did amuse me lol! Sorry I haven't 'visited' you the last few days. Have been busy with work and a poorly Chloe came home on Friday night from her school trip so she has needed some TLC. Too funny! I had to redo mine a bit too as the paper piecing just didn't photograph very well. Love the umbrella! Brilliant card, worth all the piecing. What gorgeous colors! She's just beautiful and the velvet ribbon and flower are perfect! Thanks so much for joining us at Sweet Sketch Wednesday. PS: I love Clubs...espesh choc orange! omg i want that brollie !!!! love this faye looks like everyone except me managed a fab card with paper piercing i lost patience when i tried to do the shoes and cut half of it off think im sticking to colouring !!! Oh this is totally fabby, what great paper piecing and I love the design, colours and image and I also like the way you have used the staples on that ric rac, I must try that. faberooney, love it!! I like how you have done the brolly...must get me some of those papers. Love your card Faye - gorgeous paper-piecing, its so effective. Cute image and perfect for the papers. This is so stinkin' adorable!! What fabby papers!!! And love her all pieced up! what an adorable card. I love all the paper piecing you have used on your card. It is super cute! Thanks for joining us. Your images is so sweet. I love the colors and your sweet detail with the paper piecing. Have a sweet week. Arlana@SSW!!! Oh what a gorgeous cute card Faye. So cute! Love the paper piecing! The ric rac is pretty too! This is awesome Faye! Great paper piecing and a gorgeous image! Love that ric rac too! Fabulous paper piecing on your sweet image! Oh how adorable!!!! Love your papers, your paper piecing and of course, your image! Clever girl to hold your ric rac in place with staples!! Thanks for joining us at SSW. Well, lots of do overs but just believe...now it is just perfect. I love these papers and the paper piecing is some of the prettiest that I ever seen, so glad you played at SSW so that I could see this card. Have a great rest of your week. This is ADORABLE, love your papers and fabulous paper piecing. Thanks for joining us at Sweet Sketch Wednesday. 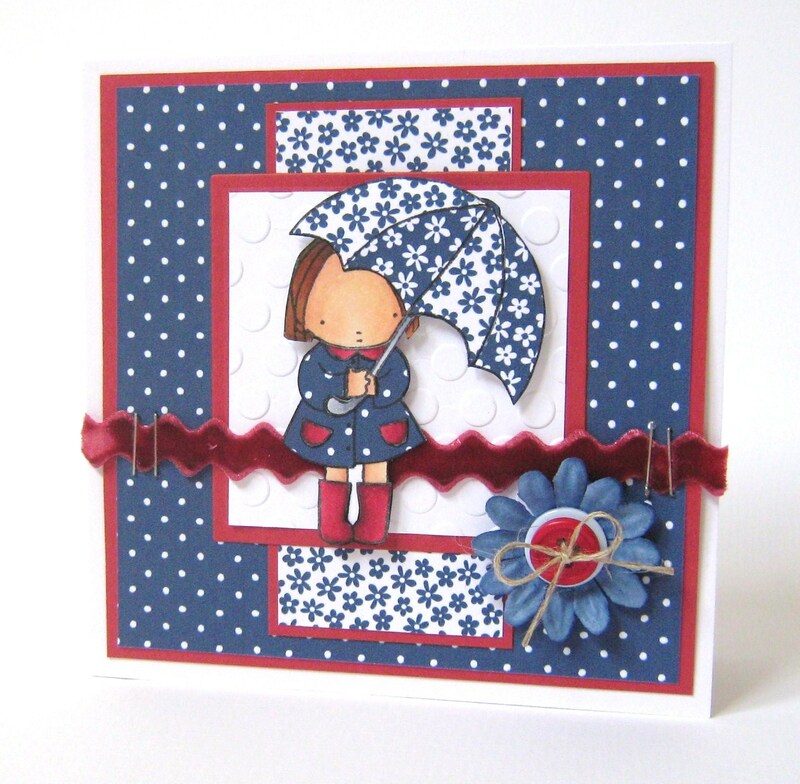 Love it hon, fab colour combo and that ribbon is lush! !